The assumption of the study is that “an increase in women empowerment and gender equality has a positive effect on countering extremism.” She gathered data on 16 indicators to identify any linkages between women’s role in a society and its ability to counter extremism. 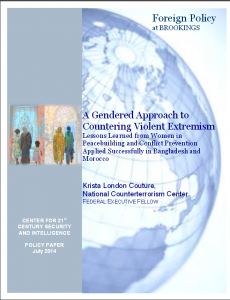 Ms. Couture claims that “violent extremism is most effectively countered through increased education, better critical thinking, and enhanced opportunities” for women and sets out to prove it in her study. Ms. Couture chose Bangladesh and Morocco because of “their direct and indirect emphasis on women empowerment to fight terrorism and its perceived factors that drive recruitment and radicalization to violence.” In Morocco, she focuses on two programs – the Moudawana, the reform of the family law code in 2004; and the mourchidates program in which women are trained similarly to imams (prayer leaders) to act as community social workers and advisors to families. The relationship between CVE and human development has been the subject of many studies since 9/11. It is clear that to Ms. Couture “investing in civilian populations is critical to the success of curbing violent extremism. An essential element of effective CVE programs mandates long-term stability.” In this context, a country’s level and extent of development is a crucial factor in CVE efforts. The Organization for Security and Cooperation in Europe (OSCE), the United Nations, and the US Department of State and Department of Homeland Security have issued reports on the role of women in countering extremism. “Strategists believe that when women are empowered socially, politically, and economically in culturally appropriate and relevant ways, they will become contributing members of society who hold the answers and solutions to complex aspects and issues inherent in CVE,” according to Ms. Couture. 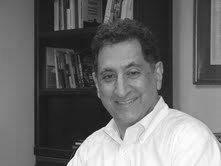 Jean AbiNader is Executive Director of the Moroccan American Center for Trade and Investment.